Sho-ha Shorin-ryu Karate-do was officially established by Sensei John Hamilton on December 22, 2002. The Sho-ha system has its roots in the Okinawan Shorin-ryu karate of Sensei Shimabuku(ro) Eizo, as taught to Sensei Hamilton by Sensei Glenn Premru. Mr. Premru had studied both directly under Sensei Shimabuku(ro) and under Sensei Sam Pearson. Mr. Pearson had been a student of Sensei Shimabuku(ro) in Okinawa. Sensei Hamilton’s time with Mr. Premru began in his early teens and lasted more than a decade, until Mr. Premru moved out of state. Following his instructor’s departure, Sensei Hamilton began operating his own dojo. Gradually over the years he made several modifications to the Shorin-ryu karate that he had been taught. These modifications were born of his own insight and experimentation, as well as of the influence of various other teachers. As obscure as Muso’s message may seem, it lead him to create a new weapon—a short staff, or jo—and techniques for the use of that weapon. Over the years, as karate has made its way from its birthplace of Okinawa to mainland Japan, and then to the rest of the world, the orientation of training has tended to shift toward emphasizing competition and contests. Tournament competition has become widespread, and even schools which do not participate in formal contests often train in a way that treats karate as more of a sport than a method of self-defense. 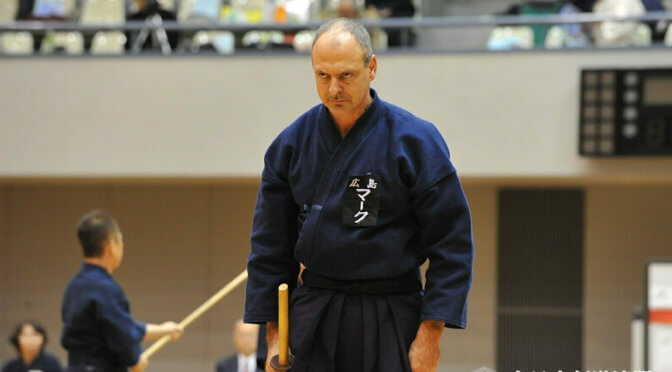 Sho-ha Shorin-ryu, on the other hand (although certainly not the only style to do so), chooses to not concern itself with such sport-based and sport-like activities, focusing rather on the original, practical self-defense aims of the art. Thus, only those techniques, strategies, etc., that can successfully be applied in real-world self-defense situations are taught and practiced. In many – if not most – karate schools, practice takes the form of three components which, for the most part, are treated as unrelated: kata(prearranged series of techniques carried out one after another), kumite or sparring, and self-defense practice. Sho-ha Shorin-ryu karate principles, however, state that one’s self-defense, sparring and kata techniques should all be closely related (if not the same), and that the practice of any one of these components should be the practice of realistic, effective techniques of self-protection also found in one’s other forms of training. Thus, the performance of katamovements whose meanings are not understood, sport-based sparring methods, and self-defense techniques that are unrelated to one’s other practice are all avoided. Training in a Sho-ha Shorin-ryu karate dojo or school takes place in an atmosphere of respect. Traditional Japanese martial art etiquette, which emphasizes respect for one’s teacher, one’s fellow students, ones’s dojo and one’s ryuha (style), is strictly followed. It is a stated goal of Sho-ha Shorin-ryu karate that one’s training should enhance one’s health, not have a negative impact on it. Founder John Hamilton has consciously striven to eliminate any practices that are destructive to the body, as well as worked to develop ways of maintaining balance in the muscular-skeletal system. It is the expectation in Sho-ha Shorin-ryu that students will be able to continue their training well into their advanced years.